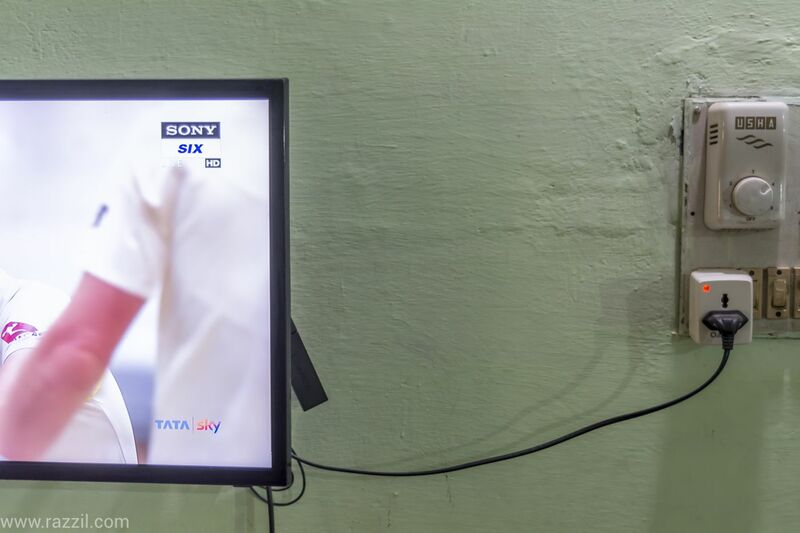 Amazon India has recently launched the Amazon Echo devices in India and I’m reviewing the compatible Smart Home devices that are available in India. Not many devices are available in India that is compatible with Google Assistant and Amazon Alexa. 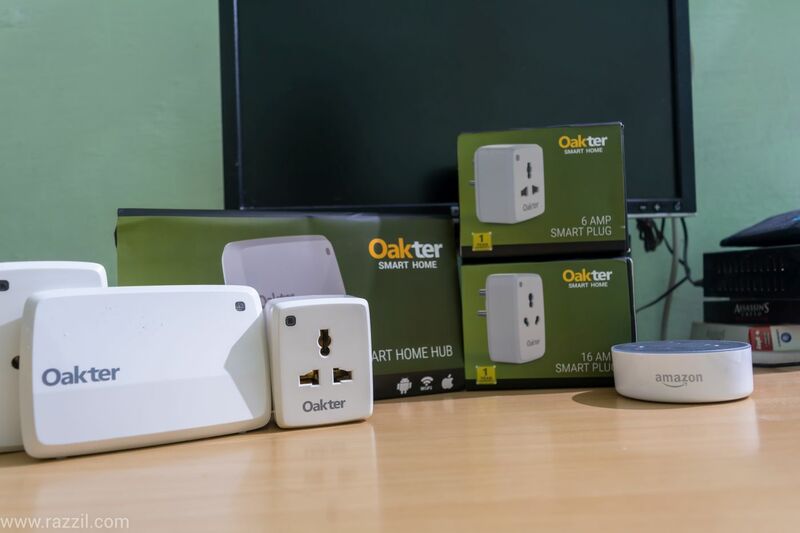 From the last couple of weeks, I’m using the Oakter Basic Smart Home Kit which includes One Hub and two Smart Plugs (6 Amp & 16 Amp switch). Oakter has complete home automation collections such as Plugs, Smart Locks, Smart Switches, Thermostat and Smart Remotes. Oakter Smart Home Hub comes with white plastic box with just light on the front side and power port at back. The Hub is average in design and also quality is also not top notch. However, I don’t care as it’ll be put somewhere in a fixed position. The Oakter Smart Plugs are huge box-like design, 16 Amp plug is even bigger than the 6 Amp one. The Plug size is so big that sometimes you’ll find hard to find space to put this plug. The Oakter Smart Home Kit is very easy to set up. Inside the hub box, you’ll get manual where you’ll get the temporary login details, which you’ve to enter in the Oakter app for the first time. After that, you can create a new account via the app. Once you log in with original details, you can set up the Hub from the Wi-Fi configuration section. Just follow the onscreen tasks and the hub will up in running in no time. Once the setup is complete, you can find the two plugs are already there in the dashboard, an additional device can be added from the app by using the unique id which is there on the back of the device. You can connect 50 plugs from the single hub and the hub range is 100 feet. You can turn on/off the plug from the app or you can also connect it with Amazon Alexa to control it from the Echo devices. 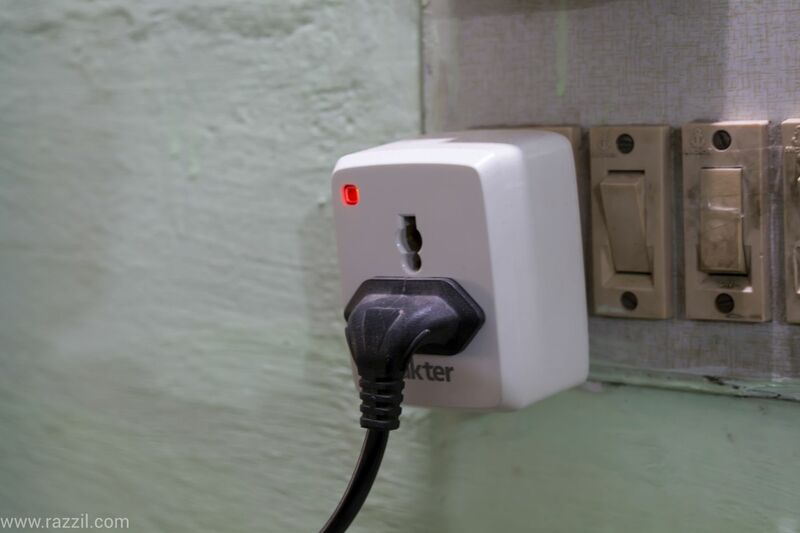 Regarding the Performance, Oakter works on RF, so it slightly takes time to respond to your command as compare it to Wi-Fi-based smart plug. Even with the Alexa, it takes 4-5 seconds to perform any action. Oakter Smart Plug can be controlled with either mobile app (available both on Android & iOS) and Amazon Echo device. You can turn on/off the plug from the mobile app. From the app, you can schedule to turn on/off the plug, set the Auto Off timer so that plug auto switches off the plug after given time. This is extremely helpful in my home where family member forgets to switch off the geyser button. All the Oakter devices are compatible with Amazon Alexa which means you can control the smart plug from the Amazon Echo. The Integration is very simple and just search Oakter skill in the Amazon Alexa app and connect it with Oakter account. Once the connection is successful, you can trigger the On/Off from the Amazon Echo. Just say “Alexa turn on geyser” and it’ll turn on the smart plug. During my testing, I found that it takes a bit too long too complete the request, maybe because it’s based on RF. It always takes 5-6 seconds to turn on/off the plug. Also notice that sometimes, the plug stop responding from Amazon Echo devices. You’ve to manually turn off/on from the app to make it work. I’m using Routine on Amazon Alexa which allows you to perform certain actions based on voice or time. I’m using the time-based event in which every day at 8 AM, Amazon Echo tell me the weather and turn geyser for me. So that Hot water is ready just before my office time. Oakter did an awesome job with Home Automation Devices, once installed the device works perfectly. Oakter just not only deal with Smart Plugs but they also provide the complete home solution including Smart Thermostat, Smart Lock, Smart Switches, and Remotes. You can give Smart Plugs access to your family members as well (Max. 5 users), you can invite them on their email address and they can login in Oakter app and can control the devices from the app. Oakter also provides the Amazon Alexa compatibility which makes it easy to operate from the Echo devices, though sometimes it becomes Unresponsive. Oakter Basic Home Kit is perfect smart devices to step up in Smart Homeworld. It’s cheaper than Philips Hue but functionality wise it’s awesome hardware. 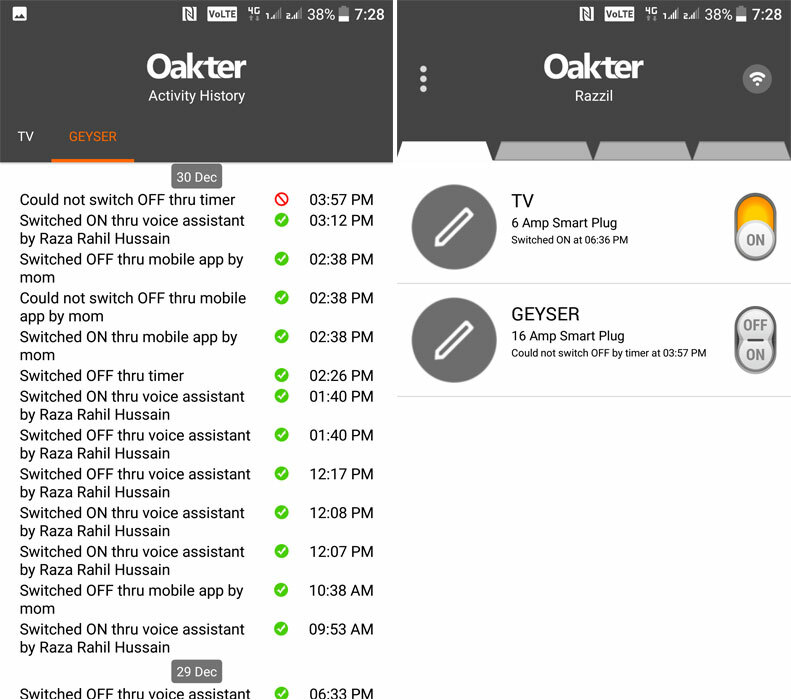 Oakter did an awesome job with Home Automation Devices, once installed the device works perfectly. Oakter Basic Home Kit is perfect smart devices to step up in Smart Homeworld. It's cheaper than Philips Hue but functionality wise it's awesome hardware.